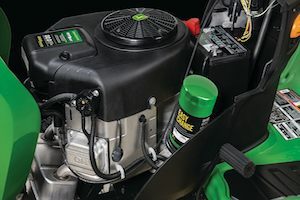 The John Deere Easy Change™ 30-Second Oil Change System won the 2018 Best of What’s New Award from Popular Science magazine. Visit www.JohnDeere.com to learn more about this system and others like it. A K-State University horticulture specialist has offered tips for practicing effective lawn care this fall and maintaining thicker, healthier fescue grass. John Deere has announced the selection of three finalists for its second annual “Small Machines. Big Impact.” contest which kicked off earlier this year. Between July 27 and July 29, John Deere collectors and fans will be coming together to celebrate 50 years of hydro-powered lawn and garden equipment. John Deere has launched electric One-Touch MulchControl™, which reduces downtime and boosts productivity. To learn more, visit www.JohnDeere.com or contact your local John Deere dealer. John Deere debuted the E100 Series, a new lineup of lawn tractors designed to provide more operator conveniences. As we move through the fall season, an expert from the University of Illinois is now offering tips for handling the foliage before the arrival of winter. John Deere has announced that high school building trades instructor Eric Moores has won the “Small Machines. Big Impact.” contest. John Deere has developed new severe-duty pallet forks, designed to handle a wide range of material-handling jobs.